Garena Free GOLD MEMBER – DotA Garena Free Gold Member (Remade by Vyper). The FREE GM is about using DARK ORBIT GAME . I will describe you STEP by STEP so it wont exist any doubts. In the Quest menu, you’ll find a list of jobs (special assignments) which your company needs help completing. If you accept a job, you’ll be rewarded with valuable prizes after finishing it successfully. In addition to jobs, there are also “Challenges”. These are quests where your performance will be rated in comparison to other space pilots. Many jobs will also be given a rating and will end up in the Challenges menu after completion. The QUESTS are necessary for leveling UP. 1st. Press the Dark Orbit Game from the icons game and press the middle button. 2nd. That`s the GAME Interface. Press the START Button. 3rd. Wait for the game to load, then press START again. 4th. Wait some few seconds to connect and after go move into the space and kill some red named space-ships with SPACE ( rockets ) and after that log out. 5th. 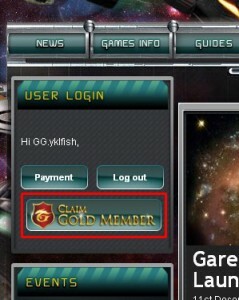 After you logged off click the DarkOrbit ICON from the garena and press the Button from LEFT. You will get a short message with number “3? in it. That means you got 3 days of free GM. 5. You can also use Dark Orbit on big levels such as 20…30…40… and so on, but you need to be from Rusia or other countries affiliated with it. 6. If you are from Rusia or other countries affiliated with it ( not country origin of account ) you can make other accounts GOLD MEMBER. For example : A friend of you can give you his account lvl 30 [ Country Origin : Romania ] and you CAN put GM on it because you are from *Russia and you have russian IP.